Anyway. The point I’m trying to make is, I picked up Gluten-Free Girl because of Shauna’s blog. I’d never read Orangette before this book, but I have definitely added it to my blog reading list (which recently warranted the creation a Foodie category, btw). This book is a treat. 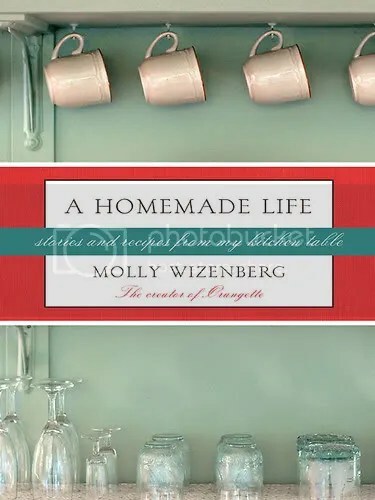 It’s a great example of how blogging can beget good writing – it’s full of personal essays that lead the reader toward a recipe, a recipe that played a role in the author’s life. The recipes aren’t fancy – nothing so strange that you’d need a picture to ease you into eating it. Riffs on home-cooking, mostly. Banana-bread with chocolate chips and candied ginger. Her late father’s potato salad. But really, the recipes were second billing to the stories. Scoops of the author’s life, some amusing, some tragic, some romantic, some fanciful, some heart-wrenchingly sad. It’s a book about food for people who like life more than they like food, really. Loved every page of it, and handed it directly to my mother. It’s just that kind of book. Kind of makes me wish every one of my favorite bloggers had a book like this to show off with.